If you plan to ski a few times (or better yet, many times) over the next few years, it’s always a smart bet to stock up on your own ski equipment and gear. Sure, having your own skis and boots and board is great, but so is having the right jacket, goggles, base layers, socks, ski pants, gloves, and on it goes. You will definitely be more temperature comfortable in the right clothes and you will certainly be overall more comfortable in your own equipment, but now you need a good place to buy. You’re in luck. We have deals and discounts set up at all of the major outdoor outfitters and ski shops, where you will have access to the latest deals, last year’s gear, and the latest and greatest. Those stores are listed below, and the discounts we have will be attached to your session as soon as you click through. But first we wanted to give you some directional advice on where to start with your gear. This includes socks, gloves, base layers, jackets, sunglasses, hats, and even goggles and helmets. For these items, they can serve other purposes beyond just skiing. They will work in all cold weather occasions, and plus, ski gear is going to be high performance and do much better than the standard Eddie Bauer stuff that just looks like it’s warm. But don’t forget goggles and helmets. I use my ski goggles sometimes when I’m dirt biking, weedeating, snowmobiling, and year round to cut onions. I’m not lying. Same with the helmet. If you have a bike or skateboard, just use your ski helmet. For the goggles, you’ll want to spend at least $100 to get into the game. Helmets, at least $70. Of course, they go way on up from there depending on your style and needs. For a ski jacket, bear in mind that every ski jacket you can buy is going to last forever and be the warmest thing you’ve ever worn. A little advice? Make sure there are vents in the armpits, as it can sometimes warm up during the day and this keeps you from shedding layers. Also, you will fall in love with your jacket and want to wear it all the time. So that bright orange Marmot jacket that you love on the slopes might not look so great when you’re going out to a nice dinner. Consider a more muted tone and whatever you do, don’t get blue. EVERYONE gets blue and you will be impossible to find on the hill if you are just another one. Good brands: The North Face, Columbia, Patagonia, Marmot, Mammut, REI, Arc’teryx, Black Diamond, EMS, Helly Hansen, Spyder, Salomon, Mountain Hardware, Outdoor Research, just to name a few. These are all going to be great and do the trick for you. Just find the one you like; the technology will take care of you. A little advice? Buy the cheapest, most expensive jacket you can. The above brands are expensive. Patagonia will be the most expensive down to REI and Columbia. They are all excellent, but they cost a little bit. So find the cheapest among these and you’ll do well. Backcountry.com is one of the largest online stores for outdoor gear and equipment. They originally came at this from a backcountry skiing standpoint, but have expanded to include all types and carry equipment well outside of skiing. Tremendous online deals. REI is one of the most well-known and well-respected brands in the outdoor gear industry. They are a co-op, which means you are an owner and receive dividends every year. They have been in business since the 1930’s, and have an arsenal of their own gear as well as carrying every other major brand in the industry. This is a great place to shop, both online and off. Skis.com is an online clearinghouse for ski and snowboard gear. This is a great place to go for the actual equipment (skis, boots, poles, boards), as they have both current year and past years’ gear. 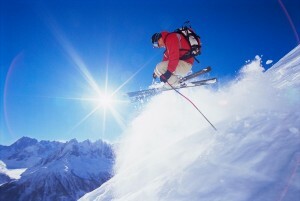 Shop online for ski brands like Salomon, Volkl, K2 and Rossignol. One of the unique website features here is the skiopedia; an online encyclopedia of skiing information. Eastern Mountain Sports (EMS) has been a reliable brand for outdoor gear for as long as it has been a known sport. Their online store is another great resource for seasonal promotions and deals on outdoor gear. Items that are available on this website range from camping and hiking gear to alpine touring skis and nordic ski equipment.